If you read Prose and Ivy regularly, then you know that I also have a podcast at BlogTalkRadio.com that compliments what you read here on-line. I’m due to record another Prose and Ivy podcast so I will set that up soon. However, as a member of the Baseball Bloggers Alliance, I also co-host a podcast occasionally for the BBA. Tonight, I was supposed to co-host the podcast with the gentleman “Web”, from the San Diego Padres blog “WebSoulSurfer”. Well, Mr. Web never showed up. So I had to host the hour all by myself. Have you ever talked about baseball to no one but yourself for an entire hour? I hadn’t either. However, now I can say I have. Hopefully all is well with Websoulsurfer…even though once again the Cubs side of things were let down by the Padres (like 1984 all over again). I tweeted about the show and asked fans what they’d like for me to say to the Padres fan. One gentleman said “Ask him if we can have Andy Masur back” (funny). Another guy said tell him, “See you in the playoffs”. I don’t know if that’s going to happen, but it may have to considering so far in the podcast arena, the Padres are a no-show. Check out what happens when one is left to his own devices for an entire hour talking to no one but himself by clicking here. Enjoy. Go Cubs Go! When it comes to Chicago Cubs baseball, if recent events have taught us anything, it’s never say always. One of my favorite things to say here at Prose and Ivy is, “We’ll Always Have Pittsburgh”. Given our performance in the past against the lowly Pirates, it always appeared on the year’s schedule as a gift-wrapped blessing. A small three day break if you will where wonderful things happen like Cubs home runs flying out of the park, pitchers dominating on the mound, Cubs ending up on the right end of a blow out and W flags are hooked to the flag pole rope at the top of the first for it’s inevitable rising after the top of the ninth. Plan to head home early folks because the Pirates are coming to town. There won’t be any Cubs batting in the bottow of the ninth because there won’t be one. These games are given. The Pirates can’t handle the talent and the skill level the Cubs bring to their games. Regardless of how the Cubs were going, if you see Pittsburgh coming up on the schedule, get ready for at least a three game turnaround and find your brooms. The Cubs were about to seem the Pirates and all will feel right again in Wrigleyville. That was then. This…is now. All of a sudden, the Cubs can’t be counted on to beat one of the worst teams in all of baseball and the cellar dweller or the NL Central. See that .342 winning percentage and the 17 games that they currently sit behind the division leading Reds? Don’t let that fool you! When the Pirates have had the all-of-a-sudden priviledge of playing the Cubs, they are a surreal .800 ballclub! In ten games against the Cubs this year, they’ve won 8 and lost 2. What?!? WHAT!?! There are certain things that this blog feels it can count on: baseball magazines and websites and blogs will have the Cubs listed as contenders in the Central, talk whether this is the year and then the Cubs will let you down come October (some seasons even earlier); Dempster will predict the Cubs will win it all; Carlos Marmol will be responsible for at least six heart attacks across the midwest throughout the course of a season; Sox fans will hate on Cubs fans and vice versa; and if nothing else is going our way, hey hey…at least ‘We’ll Always Have Pittsburgh’. Well, that last one apparently no longer applies. And it just may be a blessing in disguise. Think about how this season is going. The Reds lead the NL Central and the Cubs currently sit in fourth place looking up at the unfortunate view of Brewers behinds, hardly even keeping the Cardinals in sight, while the Reds are a ******** 10 games out in front of them. The offense thinks it’s still the off-season. Carlos Zambrano is seeing a shrink. Piniella seems to be snoozing through the first half of the season. All of our ‘all-stars’ suddenly look too old, too injured, or too apathetic. Castro started out hot and then cooled off to an average pace. Wells can’t seem to find the form that kept him one of the club’s most dominant pitchers in ’09. And for some reason, we CAN’T beat the Pirates. Fine. If that’s the way it is…if that’s the way it’s going to be, then perhaps the rest of the things we’ve come to expect can start to make a change as well. Perhaps the head shrink can get Zambrano under control and he can perform out of the bullpen upon possibly returning after the All-Star break. Perhaps Wells can find his form and start to lead this club through a charge to possibly make up 10 games to the top of the division. Our crosstown rivals just made a huge push to put themselves in the club of relevant baseball teams for this year, and if they can do it I KNOW we can do it. Perhaps we will find a way to win one run ballgames in the 2nd half of the season. Those eighteen losses in one run games might just be the single most frustrating aspect of 2010. Perhaps since what has become the norm against Pittsburgh has been turned on it’s head, maybe all of these other things we’ve come to expect from this team this year can take a change of course as well. Perhaps it is a blessing in disguise. Of course, if it does happen there is a very good chance that we may have a few different guys wearing that same disguise as there are rumors that everyone from Zambrano to Marmol to Fukudome to Lilly are on the trading block. I’m not sure how far behind we need to be for Ricketts to consider himself a seller as opposed to a buyer. He’s a good business man it seems, but he’s also a fan. I wonder how hard it must be for him to make rationale decisions when analyzing at point this particular team is no longer going to make the push it needs to contend. I wonder if Ricketts thinks Pittsburgh is just another symptom of an extremely frustrating and disappointing Cubs season. I wonder if he can find a way out of this mess and find the blessings in all of this turmoil. So many fans on-line if you read around the Cubsblogosphere have already said ‘please, no more’ or are very close to taking that flag and throwing it in like a towel. I don’t like our odds against the rest of the league if we can’t even handle Pittsburgh. However, I didn’t expect Pittsburgh to put the beating on us the way they have. Hopefully an unexpected 180 on this season’s trajectory is around the corner as well. If not Pittsburgh, we’ll always have fool’s hope, right? The MLB championship is out of our Cub reach for 2010. Time to accept that…but who cares. That trophy is overrated. Let’s be honest with ourselves…the Crosstown Cup is our coveted ark. If this season were an action film it’d be Lou Piniella Jonesin’ with the Cubbies After the Lost BP Ark. Now is the time to step up and make all of our Cub dreams come true…win the next two games in an epic fashion and tie the Chicago White Sox for the BP Crosstown Cup. The BP Crosstown Cup awaits and we are now in a must win situation. Dave Roberts and the Red Sox in 2004? That’s nothing compared to Lou Piniella and the Chicago Cubs of 2010. Time to make history. Time to go get the greatest prize in all of sports. Get the ticker tape and the police horses ready. There’s going to be a whole lot of thrilled Cubs fans crowding the city of Chicago come Sunday night when the whole town rejoices the Cubs claiming the BP Crosstown Cup over the Chicago White Sox in a historic comeback of epic proportions. Never in the history of baseball has any team ever come back from being in a 3-1 deficit in a Cup clinching series with two games to play and the opportunity to tie for the Cup. Never. The Cubs can be the first. Starting this weekend’s series already down 2-1, the Cubs rolled into Sox territory on Friday and lost it….and then lost it. Zambrano gave up some hits that he thought should’ve been stopped by Cub fielders. It resulted in him serving the team with all that he had for an entire 1 inning. After closing out the first and giving up four earned runs including one three-run bomb, he got to the Cubs dugout and immediately let loose on his teammates. Holding nothing back in what was probably a mixture of Spanish and English, Carlos Zambrano let his battlemates know how unhappy he was with their performance and followed up his 2009 signature game with another strong outing in the dugout destroying another Gatorade machine. This was the type of performance that will be mentioned along side some of the greatest pitching performances of all time. Schilling’s bloody sock game? Mariano Rivera’s overall career in the post-season as an absolute shut-the-door-kinda-closer? Good luck measuring up and reaching the number one spot when the greatest moments to ever take place in the game of baseball are discussed. Carlos Zambrano went out and put forth an effort that left manager Lou Piniella nearly speechless in the post-game press conference. The team, mind-blown from their ace’s outing, have no idea what to do next with their Opening Day Ace-turned bullpen stop plug-turned best option to fill a void in the rotation. What else does he have left to achieve? What else does Carlos Zambrano have to do to prove to people his place in the game of baseball? Soto escorted Zambrano out of the dugout after the amazing course of events took place clearly wanting to take the great one away from the mere mortals around them. Lee was so taken by the great pitcher’s display of effort, ability, passion and love of the game that he too started to yell along with Zambrano hoping to fire up his teammates and share in this historic moment with one of the greatest characters in the game. Galarraga not flipping out after a perfect game was stolen from him? Give me a break. Carlos Zambrano knows what it takes to gain respect from his teammates, manager, coaches, GM, fans and opponents. This is exactly the kind of attitude and effort the Cubs need this weekend to stake a shared claim to the sport’s biggest prize. They all need to look at how Zambrano presents himself as a winner, follow his lead, and dig out of this 3-1 hole to a victorious 3-3 games a piece in the Crosstown Cup series for 2010. With two games to play the Cubs can tie and share the parade with the team on the South side of town. Piniella said repeatedly after the game that he is embarassed. Of course he is. It’s embarassing how good we are right now and the opportunity that’s been presented to us to tie for baseball’s prized joy, the reason players play this great game. It’s embarassing how fortunate this franchise is and has been for the past century. Down 3-1, the Cubs are in a must win situation over the next two games in order to tie for the BP Crosstown Cup. You probably never thought the day would come. You think the Lakers’ victory in the NBA Finals brought commotion and disorder to the streets? Wait until Chicago has their Cubs at the top of the BP Crosstown Cup world, tied with the White Sox. No taxi will be safe my friends. The Cubs win the next two and history will have been made, dreams finally realized. 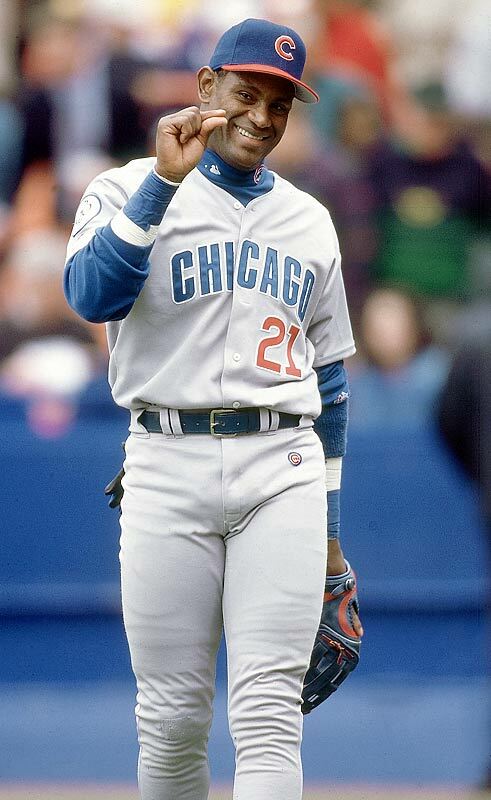 Hey Sammy, how much should Chicago care about the Crosstown Cup? Beat Peavy and the Sox today and then sweep the weekend and it’ll be great. But I still think it’s sad the city has invented it’s own trophy to be won. I guess that’s what happens when one of your clubs goes over a century without winning the real one. So we may have found a way to improve our record in one-run ballgames! Easy! Just wait to win until the 13th inning! Lilly was great yesterday and it’s a good thing the Mariners were even worse at cleaning up the basepaths than the Cubs were. Tons of men left on base resulted in a marathon of a game for the Cubs in Seattle and Piniella enjoyed getting the best of his former ballclub. Of course one-run ballgames happen often in baseball so we’re going to find a new way to come out victorious. It’s not even July and we’ve already played in 27 one run ballgames out of the nearly 80 games played. Do that say 30 more times this season in the second half and the time leading up to the break and then add 4 innings to each of those games and you’re looking at playing 120 extra innings! While those wins would certainly come in handy, adding about 11 games to your schedule with this group of old fragile Cubs is not exactly a recipe for success. Clearly that won’t happen, but you get my point. Grateful for the win, nervous about us finding a way to keep it up in one run ballgames. Today Zambrano, Mr. Opening Day starter to the bullpen, back to the rotation, takes the mound against the White Sox. Now, I dislike the White Sox just like you. What do I dislike even more? The Crosstown Cup. That’s right. I dislike the Crosstown Çup even more than I dislike the White Sox. This Cup is ridiculous. The Blackhawks won the only Cup that should be in Chicago right now. And at least they had a plan for how to get the damn thing if they ended up in a tie…because they’d play until there wasn’t one! What happens if the Cubs take two out of three this weekend? The series will be tied at 3. The first year of the city’s beloved Crosstown Cup…and no plan for a series tie? Does it simply end with no one winning the cup? Do they go to runs scored? Whose team had the bigger idiots in the stands? Number of gatorade coolers smashed? Best insults thrown from fans of the opposite team? Zambrano v. Peavy tonight to kick it off. Cubs look to either sweep or win two out of three to tie the crosstown series up. They better sweep with regards to the Cup, because of they don’t and only manage two out of three…..then what? I still can’t believe the Central is turning into a two team race and it’s the REDS battling the Cards for the division lead. I felt in the beginning of the year that the Cubs are probably in a position where they are just too brittle and a little too old to really contend. I picked them to win it all (of course) however deep down I knew it would take something more than a miracle to make it happen. Sure, adding Castro was exciting and brought the team’s average age down a bit but in the end, he’s part of a team struggling to find a way to make it over the hump and win on a consistent basis along with the Cards and Cincinnati. We’re not in a very good position looking up at the Reds with our star third baseman changing his batting grip because he’s too hurt to hit the way normally does and has for over a decade now. It’s not good that that same player is openly speaking to the fact that the entire locker room is filled with guys playing through pain. Look at the calendar. It’s only June 23rd. We haven’t even hit the all-star break yet. We haven’t even made any significant dent in the dog days of Summer. We’re eight games back, too fragile, too old and too unlucky. Piniella is hoping we hit a streak leading up to the big game. Why wouldn’t he? Of course he does. He’s a winner and he wants to win. However I don’t see it happening with this squad in 2010. Piniella recently mentioned the team is 10-16 in one-run games this year when a reporter brought it up. 26 games so far this year that the team was in and yet we fall six games under five hundred in those contests. Intangibles and luck win you one-run games and we are falling short in both cases. Lilly started the season late and while physically present, has really shown up in the stat or win column the way we need him to. Chances are Carlos Silva will be the team’s lone representative in the All-Star game on July 13th in Anaheim. I’ve said it before and will say it again. Carlos Silva?!? If he’s the best we’ve got….the guy no one expected much from except to show up to the Cubs like aspirin and help rid us of a headache…then we are in big trouble. Remember a couple years ago when the NL All-Star team was flooded with Cubs? I attended the all-star parade that year here in New York and it was awesome to see our favorite Cubbies rolling down the Avenue of the Americas representing the best of the NL and the Cubs team with the most potential since the flip of the new milennium (yes I believe our 2007 and ’08 squads were better than the ’03 team). Now we’re simply shells of our former potential. The last names are the same but the guys in those uniforms are simply beyond their true opportunity to win it all. It’s sad really but without significant moves or a stroke of dumb luck, once again this will not be our year. This is that weird time of the baseball season where it’s too late to say it’s early and it’s too early to say it’s too late. However this team needs to dig deep and make things happen quick. Find a way to get on base and score some runs to support our rotation. Find a way to win one-run ballgames and of course when possible, enjoy being on the right side of a blow out. Some big series are coming up and lots of baseball left to play, but boy, oh boy…it is time to dig in and start looking like contenders. Cincy and St. Louis aren’t messing around and aren’t going to wait around for Chicago to get it’s act together. Almost feels like it’s time to get that Cubbie swagger back that they had a couple years back, basically refusing to lose and just plowing ahead all about winning. I went to Mets/Tigers tonight and the Mets improved on their home field advantage driving their record at home to 26-10. They are a team that seems to have figured it out and are simply refusing to lose at home. You can see a confidence in everything they do. Winning breeds confidence of course, but I also believe a little bit of confidence or swagger might do the Cubs some good as well. Going back in a couple weeks to see the Reds when they come to town. Will be interesting to see one of baseball’s biggest surprise up close and personal. On a personal note, things have been crazy lately as I’ve been completely baby crazy. Found out that my wife and I are having a little BOY come October. A BOY. So cool. Can’t wait to take the little guy to Citi Field and experience the great game of baseball. Of course a trip to Wrigley is on deck as soon as possible too. Never too early to catch a game at the greatest park in all of baseball. A wild summer of hoping for playoff baseball and figuring out how this baby stuff is going to work come October. This Fall is going to be exciting regardless with the little guy on the way…but throw in some playoff baseball and never mind blowing my mind. My head might explode. Go Cubs Go! Carlos Silva with the best start a Cubs pitcher has had since the beginning of time. The Braves are one of the hottest teams in baseball. The Mets are 22-9 at home. Galarraga came one out away from a perfect game and still recorded what would’ve been 28 outs in a perfect world. It would’ve been the third perfect game thrown this season. The Baltimore Orioles were the first team to fire their manager this season. Zambrano starts a record of consecutive Cubs Opening Days, moved to pen, then back to rotation all BEFORE June. Schilling has hardly said anything controversial this season. Griffey Jr. retires during the season instead of waiting until the off-season. The Reds holding strong in the NL Central at 33-25, .5 games behind the Cards and 6.5 games up on the third place Cubs. The PIRATES are 12-6 in one-run games. The PIRATES. Dontrelle Willis is a D’back. How is he not the Tigers’ own long time dominator he was supposed to be? I actually watched about 10 minutes worth of the MLB draft. I guess that’s something. Ted Lilly is 1-5. Leading the club at 8-0? Flipping CARLOS SILVA!!! The Blackhawks are in the Stanley Cup finals. WHAT?!? This season has been full of surprises. Some more unfortunate than others. Most unfortunate: Griffey. Next: Lilly. Least unfortunate: Silva leading the club in wins and being the man. Someone tell the Reds that’ll be enough out of them please. I mean, really. Go Cubs Go! Let’s start surprising some folks and move our way on up the NL Central standings!